Aaron Haire - one of the summer exits from Lurgan Celtic. Pic by PressEye Ltd.
Lurgan Celtic’s competitive campaign kicked off in winning fashion last weekend with a penalty shoot-out success over Bangor. 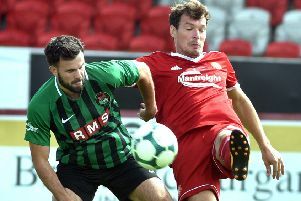 The Northern Ireland League Cup first-round clash at home offered an opportunity for revamped Celtic to step out following an inconsistent summer schedule. The exits of established players such as Aaron Haire, Adam Rodgers and Brendan Shannon left manager Colin Malone rebuilding key areas. Saturday’s knockout test presented a first chance to showcase the new-look side - with Celtic marching on courtesy of penalty joy. A speculative effort by Ross Craig handed Bangor the upper hand and left Celtic reeling early on. However, Malone’s men regrouped and managed to gain control of possession without offering a cutting edge before the break. Josh Barton and Dale Malone combined along the left after the interval and the latter’s cross was converted with a back-post finish by the supporting Conor McAnallen. Celtic pushed on from the boost but the tie entered extra-time. Both sides had sights of goals - with Bangor failing to make the most of a gilt-edged opportunity. Raymond Fitzpatrick converted the first Celtic spot-kick after Bangor grabbed the opening penalty success. Barton kept the teams level after another Bangor hit home before Conor McCorry produced a smart stop to save the next spot-kick. The goalkeeper then stepped up to hand Celtic control in the shoot-out. Bangor finished with converted spot-kicks but Celtic managed to match that return thanks to Shane McCabe and Shea Conaty for a 5-4 win. Leading players on the day for Celtic were Barton, Stephen Hutchinson and Jordan Gibson. Celtic will visit Knockbreda in the next round of the Northern Ireland League Cup on Tuesday, August 30.